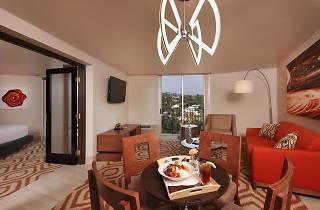 Close proximity to the 405 freeway makes this hotel a good jumping off point for exploring surrounding neighborhoods on the west side of town, as well as the area’s beaches. The relaxed, modern rooms offer good value for the price—not to mention fantastic views—and there are bonus amenities, like a nightly wine hour. Set on a stretch of the freeway that’s halfway between Westwood and the Getty Center, you can view the Hotel Angeleno as the renegade of the Westside set. Despite its bustly location, it’s got a slick, urban feel that’s largely thanks to a massive top-to-bottom renovation that took place in 2016. Rooms are nicely equipped with adjustable mood lighting, Bluetooth streaming media hubs and plug outlets galore. Meanwhile the toned-down decor sets the stage for the hotel’s crowning feature: as a standalone tower with few surrounding high-rises, all of the balconies command exceptional views of the L.A. cityscape, of the twinkling taillights on the 405 and extending all the way down to Santa Monica. The three main reasons guests book here are the views, the connectivity to the 405 and the restaurant, West. The 17th-floor eatery is surely a highlight, with stained wood ceilings and cozy lounge areas for hanging out before a meal. During happy hour, the bar pours 405-themed drinks with names like “Carmageddon” and “Road Rage,” a fun poke at the hotel’s—and L.A.’s—complicated relationship with pervasive auto culture. 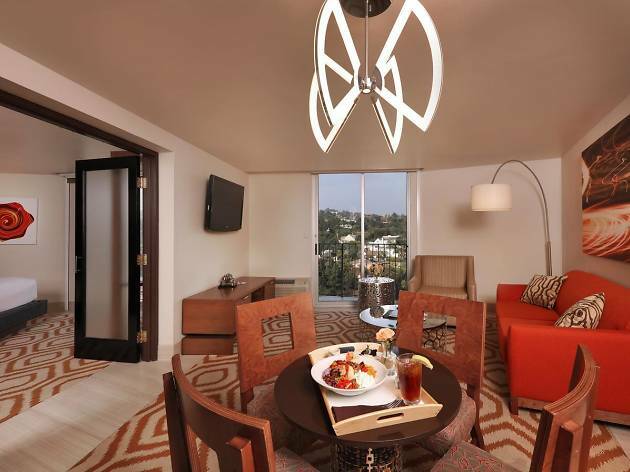 Location: This hotel sits right along the 405, two miles from downtown Westwood. While it doesn’t allow for convenient walking, you’ll enjoy an abbreviated travel time to other neighborhoods like Santa Monica, Beverly Hills and Malibu, thanks to the easy-on, easy-off freeway access. The Getty is only a five-minute drive away. The Getty Center: Five minutes from the hotel by car, this iconic museum took 13 years and about $1 billion to build. The end result is a remarkable complex of travertine and white metal-clad pavilions with world-class art, along with a café, restaurant, and gardens. Westfield Century City: Four miles from the hotel, this immense mall has a nice mix of high-end (Brooks Brothers, Swarovski), main-street (Gap, Sunglasses Hut) and boutiques like Aritzia and Compartes chocolatier. There’s also a 15-screen movie theater, a 3-story Nordstrom and an Eataly. Stan’s Corner Donut Shop: Two and a half miles from the hotel, this Westwood staple is a great way to start a day of exploring: the donuts are cheap, supremely decadent, and they hold a special place in the hearts of UCLA students and young professionals. Urth Caffe: Drive 15 minutes from the hotel to get to this beloved lunch and breakfast spot, which is part of a small local chain. The fair-trade coffee, boba tea and matcha-ccinos are worth the trip alone, but the frequent celeb sightings will be of interest to out-of-towners. Good for: Couples will be left to their own devices at this intimate boutique hotel, which offers modern rooms with great views. The top-floor restaurant is great for romantic dinners, while nightly wine hours and free valet parking help ensure bang for your buck. Time Out tip: All the rooms feature floor to ceiling windows, and since the building is circular, there’s no such thing as an obstructed view. However, the 11th through 15th floors are classified as Killer View King Rooms, which provide truly panoramic sightlines over the city. For an extra $25, the upgrade is entirely worth it.